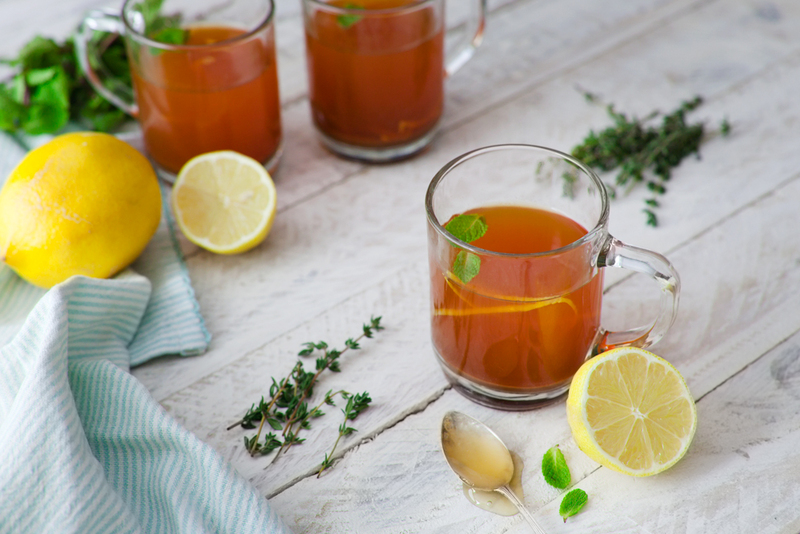 Soothing, warming and comforting, this is one of those simple but powerful hot drinks that will raise your spirits as well as strengthen your immune system. We loved the flavour element the thyme added and so were quite generous with it, but you don’t have to get stuck on the ingredients – you can tweak it in a hundred different ways – and we give you some ideas to play with whatever suits your mood in the moment. Besides being a satisfyingly enjoyable blend, each ingredient in this tea was chosen for its flu-preventing health benefits. And you’ll notice we steer away from using boiling water, and allow the tea to cool before adding many of the ingredients so as to preserve the nutritional goodness in each. Baobab powder is a nutrient-dense wholefood packed with Vitamin C, calcium, potassium, magnesium and fibre which also acts as a prebiotic. Thyme reduces inflammation in the throat and helps to soothe an itchy cough thanks to its antibacterial, antifungal and spasmolytic properties. Mint can help alleviate inflammation and the temperature-spike associated with headaches. Lemons are alkalising, helping to balance the body’s PH and fight illness. They are also antibacterial, and – of course – rich in Vitamin C.
In a small bowl, mix the baobab powder and cinnamon together with the honey. Add the thyme and mint and give it a minute to steep. Stir the spiced honey into the tea, and use a little hot (not boiling) water to get every scraping of honey out the bowl. Squeeze the lemon into the tea and give it a good stir. Pour into mugs through a tea strainer or sieve.